WITH internet TV and HD streaming services at last maturing, we at last have reason to wean ourselves off personal devices and return to the now-revitalised home theatre. Hell, LG just dropped an absolute class act in the form of a “rollable” telly at CES2019: the screen retracts either partway or fully into a small base when not in use, as if those pinky-thin screens weren’t already neat enough. But mark our words, revolution is coming, what with how powerful and refined projectors are getting. And there’s nothing as awe-inspiring as turning your entire living room wall into a silver screen with the help of your own wall-mounted projector. So up your Netflix-and-chill game, toss out that crummy 2016 telly and snag one of these bad boys. Pro tip: get multiple mounting points set up you can project onto the ceiling when you fancy; there’s no viewing experience quite as indulgent, nor a better excuse to get someone comfy on a throw rug (or bed). This option’s perfect for those who are turned off by the idea of drilling for and mounting a projector in the home. Chances are, you’ve already got the TV console against a wall in your apartment. The LG PH55HT / PH450 is designed to sit atop these consoles and spit out 720p-quality video, which could sound mediocre to some, until you mention that the resultant ‘screen’ is an 80-inch monster.That’s almost a mattress’s worth of real estate and a good 2.5 times larger than the 50-odd-inch tellies in most flats. This device works in pretty much the same way as your in-car HUDs: the projection’s mirrored and cast (or “thrown”) in such a way that light falls on the intended surface, free of keystoning or warping. As with all projectors, the size of the projection can be tweaked. The further away from the wall the little box goes, the bigger the resultant image. The 80-inch screen is achieved by just setting it up 33cm away from your wall. The caveat of this compact wonder is that it packs just enough firepower to light up the recommended inches – but if you’re aiming for the “full wall” experience, or are insistent on Full HD quality on your movies, you’ll want to turn to the heavyweights in this list. Its pocket-friendly price and lean form factor make it an easy choice for newcomers. Available via Qoo10. Buying a projector is tricky business – there are far too many numbers thrown around for a consumer’s own good. Boiling down the jargon to the three most significant, image-related ones, you’ll want to look out for high lumens or brightness, so you can see images clearly even in non-darkened rooms (go for two to three thousand), a good contrast ratio so your blacks look pronounced from the grays (10,000:1 is a good start), and the maximum supported resolution so you can see the freckles of Tinseltown in all their glory (1080p is pretty much the baseline for a good viewing experience, and it scales up to 4K these days). Don’t forget to check on other features you think will improve your user experience; for example, you could hunt for a projector that you can wirelessly beam your Netflix stream to, or shop for a portable option with decent battery life. It should come as a relief, really, when your top-of-the-line exemplar hails from a brand you’ve never heard of. The reason why Taiwan-based Optoma is relatively unknown to most is that it makes projectors – among them industrial-grade beasts that are used in full-blown cinemas – and little else. They also consistently produce world firsts in the arena. The Optoma UHD60 pictured above is the apex player in a tightly contested space, delivering that little bit of extra quality on already stunning 4K / UHD capabilities. At 3000 lumens and sporting a crisp contrast ratio of 1,000,000:1, you’re going to get near TV levels of clarity and vibrancy. The cherry on top? The UHD60 does HDR (High Dynamic Range) admirably – meaning it’s making use of that contrast ratio to deliver video with visual “depth”. You may not overtly perceive this added depth on the screen normally, but it contributes greatly to a sense of “being there” with the characters instead of just watching them through a medium. Be prepared to enshrine this baby in a dedicated mount – keystoning isn’t supported, so you need to have it placed fairly close to the height at which you want to project. This is what you’ll part with ~S$2,405 for. Available via Amazon. At almost half the price of the Optoma above comes BenQ’s HT2050, the top-of-class in the mid-budget pack. Dedicated Home Theatre projectors like these tend to operate in darkened rooms custom built for the purpose (explaining the non-remarkable 2,200 lumen mark), but deliver, accordingly, sharper relief between colours and tones. Most notably, users will find the HT2050’s deliberately short throw a boon in smaller confines – this essentially means you can put up a larger picture while at shorter distances from the wall. Available via Amazon. Running an soho-style business means you may have to entertain both vendors and clients in both senses of the word. NEC’s versatile NP-ME401W is just the ticket, blending the image quality usually reserved for movie junkies with the vast capabilities of a business-focused projector. Just take a look at how many ports there are on this thing. We’re pretty sure that spans the last three decades of connectivity, so you’re insured from the awkward situation where everyone has to crowd around a single laptop. It also slings the most light (4000 lumens), allowing presentation under all circumstances, while maintaing a respectable contrast ratio of 6000:1 and, more importantly, the disappearing keystone function, which rids you of alignment issues that may plague the newer breed of projectors. Available from Singapore Projector. If you’re jetting around and barely spending any time in one spot, turn to this pocket miracle. 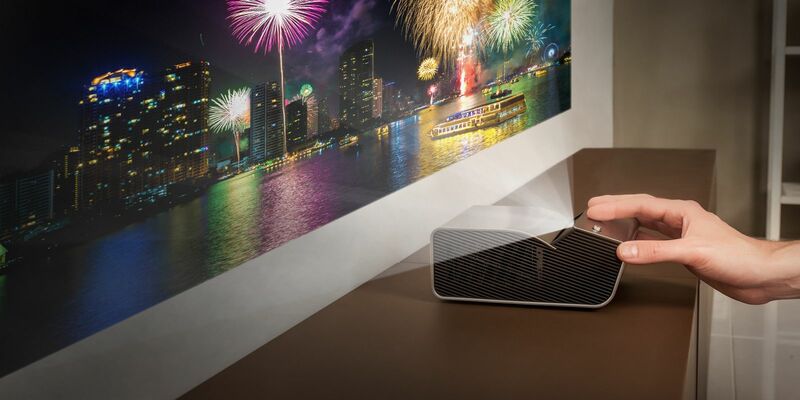 The Vamvo S1 Mini Ultra-portable Projector costs a nickel, is about as as portable as two-and-a-half smartphones stacked together, and throws out enough lumens (1800 – that’s not an extra zero) to put many full-sized projectors to shame. That last trait is particularly useful in business travel settings – you can plop the fellow on the included tripod and deliver presentations even in boardrooms that have floor-to-ceiling glass windows with natural light streaming in. The 2-hour battery life is astounding for such a compact frame, and the usual host of wired connections (HDMI/USB/SD card) support products from the iOS and Android spheres, as well as TV boxes or laptop / desktop input. The projector’s strong enough to put up a 130-inch show given the right space to work with – that’s how bright the lamp is. No drilling’s required here – if the tripod doesn’t suffice, just use a phone clamp with suction cup or clamp to fix the projector’s position. Available via Amazon.